Paytm Mall Republic Day sale will end tomorrow at Midnight 12:00 PM. The JBL is an official sponsor of upcoming movie Gully Boy. in ref to this, the JBl is offering up to 50% off on their devices till January 26 on Paytm Mall. 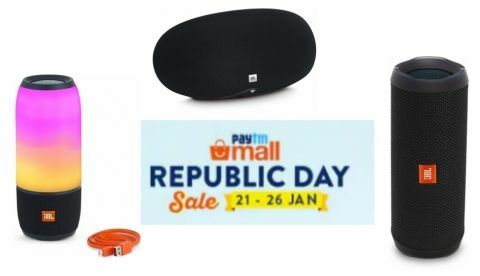 The Paytm Mall Republic Day sale has kicked off on January 21 and now it is about to end tomorrow by midnight. The Paytm Mall has partnered with JBL and offering up to 50% off on their devices. The offer is valid till January 26. The JBL is an official sponsor of the upcoming movie Gully boy starring Ranveer Singh. During the sale period, those who will make a purchase from the site will be eligible to win prizes such as Gully Boy movie vouchers, autographed JBL merchandise and more. If you're a big fan of Ranveer Singh and waiting for your "Apna Time Ayega" moment to meet him then this might be your best possible chance as a few lucky winners will also get an opportunity to meet the cast. Besides that, you can also get an additional 10% discount on an American Express card. So, let’s take a look at the best JBL deals that are available on the site during the sale. The JBL Flip 4 is a wireless Bluetooth music streaming device that comes with an IPX7 rating. The speaker was originally launched at a price of Rs 9,999. During the sale, you can get it for Rs 8,000 (appx) that includes Paytm Mall cashback as well. Check out the deal here. The JBL Pulse 3 is an IPX7 rated waterproof Bluetooth speaker that comes with customizable 360 degrees light show. The speaker can be connected to up to 2 devices at once wirelessly. During the sale, you can get the device for Rs 14,129 (including cash back) down from its MRP of Rs 15,999. Check out the deal here. The JBL Xtreme Bluetooth Speaker can be connected to up to 3 devices at once. It packs 10,000mAh battery that can provide up to 15 hours of audio playback in one go. The speaker is available on the official JBL website for Rs 18,399. During the sale on Paytm Mall, you can get it for Rs 16,559 (including cash back). Check out the deal here. The JBL Playlist 150 is up for sale and available on Paytm Mall with a flat 50% off. The speaker is available on JBL official website for Rs 13,999. From Paytm Mall, you can get this speaker at Rs 6,119. Check out the deal here. The JBL E35 over-the-ear headphone can be bought at a discounted price of Rs 1,759 on the sale. One can also get an extra 10% discount on making payment through an American Express card. Check out the deal here.